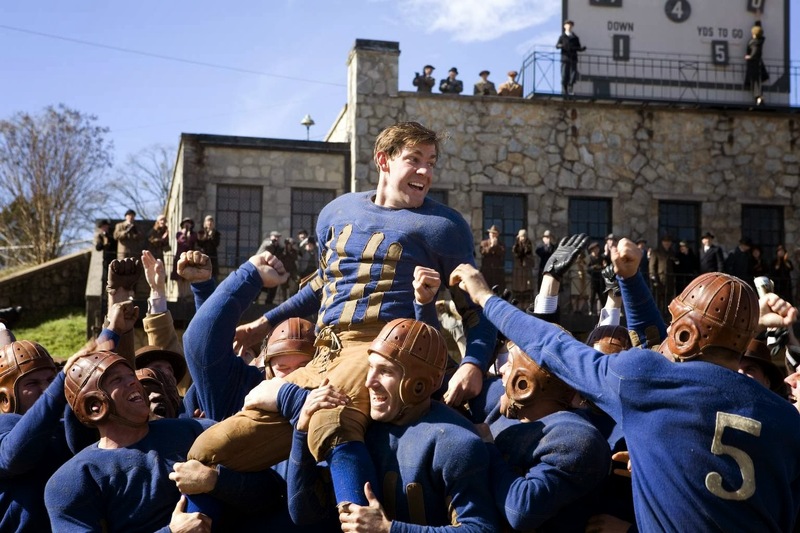 Leatherheads is George Clooney's third film as a director, and like his previous efforts its most appealing aspect is the classy and nostalgic reconstruction of a bygone age. After immersing himself in the world of television in Good Night, and Good Luck and Confessions of a Dangerous Mind, Clooney's latest picture is a tribute to a golden era of cinema. More specifically, it's a tribute to the screwball cinema mastered by filmmakers like Howard Hawks and Preston Sturges; madcap pictures in which the only thing faster than the plot developments was the dialogue rattling out of the actors' mouths. For Clooney, this seems like an ideal vehicle, on the back of his Grant/Gable-esque performances in the Coen Brothers' O Brother Where Art Thou? and Intolerable Cruelty, and his reputation as the most old-fashioned of modern-day movie stars; but Leatherheads is not the nutty treat I was hoping it would be. The film is sluggish and wayward when it needed to be tight and pin-sharp, and a film that desperately wants to be light on its feet ends up stumbling towards the goal-line with its boots caked in mud. Clooney's picture is set in 1925, and he introduces us to this milieu by contrasting the fortunes of its two lead characters, both American football players. Carter Rutherford (John Krasinski) is an ace college player whose record as a war hero and clean-cut good looks have made him a star, with thousands of adoring fans turning up to see him play and his manager CC Frazier (Jonathan Pryce) has ensured the lucrative sponsorship deals keep rolling in. It seems like a completely different sport to the kind played by Dodge Connelly (Clooney) and the Duluth Bulldogs, with "professional" football basically boiling down to a rag-tag bunch of toilers grappling shapelessly in the mud, before the matches almost inevitably end in a mass brawl. The spectators are sparse, and in the game that opens this picture the most interested onlooker is a cow (who provides some very funny reaction shots), so it comes as little surprise that the Bulldogs are on the verge of financial collapse, with Dodge and his teammates facing the terrifying prospect of rejoining the workforce. In desperation, Dodge gambles on Carter, signing "The Bullet" up for the Bulldogs in the hope of drawing some crowds; but he gets more than he bargained for, with Chicago Tribune reporter Lexi Littleton (Renée Zellweger) already on Carter's tail, intent on debunking his war hero story as a myth. Inevitably, both men fall for Lexi, and this seems like the perfect setup for a screwball comedy from the classic mould, but Leatherheads has no spark. Part of the problem lies in the dialogue found in Duncan Brantley and Rick Reilly's screenplay, which isn't anything like as witty or imaginative as it needs to be. Much of the repartee – including exchanges like "I didn't come here to be insulted", "Oh? Where do you normally go?" – is too predictable, and few such back-and-forths manage to raise a laugh. Clearly, Clooney is aiming for His Girl Friday territory with this project, and while there's no shame in looking like a poor relation next to that classic, the zinging lines in Leatherheads feature a disproportionately high number of duds that flop sadly onto the screen as soon as they've been uttered. The actors are at fault as well, though, and – try as I might – I still remain completely resistant to the supposed charms of Renée Zellweger, who just seems all wrong for the role of Lexi Lexington. Sure, it's a tricky role to take on, requiring a style of acting that doesn't come naturally to today's actresses, but it can be a glorious if the actress in question is really gets her hands around it (watch Jennifer Jason Leigh in The Hudsucker Proxy for proof). Zellweger doesn't come close, though; her face is constantly pinched, her mannerisms unsure, and her weak voice – half croak, half whisper – doesn't give the dialogue any weight. She's neither likable nor interesting in a role that requires some fire in the belly; and while her co-star Krasinski is given very little to do, he at least plays his all-American boy with personable good grace. As you'd expect, Clooney himself is in his element with the central role, and for large chunks of the film he seems to be holding the whole rickety production together through the sheer strength of his charm alone. One wonders if he hasn't spread himself a little thin by taking on both directing and leading man duties for the first time, though, and this performance is far from his best, with some of his line readings coming off as lazy and smug. The great thing about Clooney is that he's not afraid to look silly, though, and many of Leatherheads' best moments are derived from the actor embracing his goofy side. He resurrects his funny "punched in the face" reaction first employed in O Brother, Where Art Thou?, and I liked the well-stage sequence in which Dodge and Lexi flee a speakeasy raid, ending up on a window ledge above a suicidal man. The film has other incidental pleasures to offer – a drunk Carter confronting the two leads, or a pianist continuing to play during a barroom brawl, pausing only smash a stranger's head with a bottle – but that's the problem; at times it feels like the film is built out of nothing but incidental pleasures. There's no consistency in its storytelling, bursts of manic energy are followed by long, sluggish stretches; and while the period detail is wonderful (Newton Thomas Sigel does typically brilliant work), the picture as a whole just seems happy to trundle along in second gear. Even at the film's close, when you'd expect the big-game finale to rouse the picture out of its stupor, Clooney just doesn't seem interested in picking up the pace. The final match-up, played in ankle-deep mud, is messy and dull; lacking forward momentum, and with both teams struggling to make any mark on the scoreboard. How very apt.